On the face of it the Western Distributor, proposed by Transburban on Thursday 30 April 2015, appears to be quite a compelling and clever project. The new road would spur from the Westgate Freeway near Williamstown Road and head north-east by tunnel and viaduct to Footscray Road and CityLink and would be funded two-thirds by Transurban and one-third by Government. No homes would be acquired, the inner-west would no longer lie sleepless with the sound of trucks through residential streets, but it is the impact on Footscray Road and Docklands which has raised my concerns. After the road surfaces it would travel by viaduct over the Maribyrnong River and above Footscray Road which is already eight lanes wide with a central median and east-bound service road without the addition of six lanes raised above. A viaduct here is clearly overkill and would look so disgusting that it would attract anti-social behaviour and repel developers when the port and distribution centre have moved on. 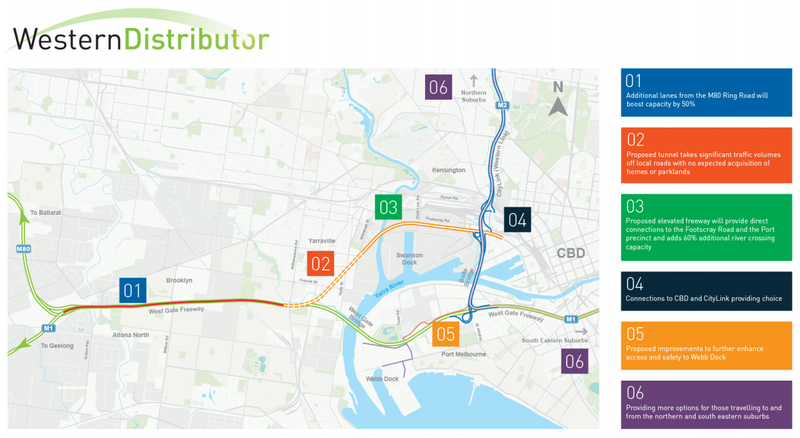 Furthermore, Transurban propose extending the new road just east of CityLink which would funnel car traffic into Docklands and Melbourne’s central business district – the opposite of what cities around the world are trying to do. Cars are to cities what saturated fat is to your veins. They are the easy way out, your quick and tasty meal. About three cars transporting three people take the space of a small Melbourne tram carrying up to 70 people each, most of which are already stuck behind private transport. The idea that we should further encourage car travel to the CBD is ludicrous, but this is where we hit a wall. This road should be about providing easy truck access to Swanston and Appleton docks, much like the East-West Link was secretly about providing truck access to the previous Government’s proposed port at Hastings, but Transurban have proposed this project not because they care about getting trucks off the streets in the western suburbs, but because they believe it will make them a profit. Trucks alone are unlikely to do that. If the state Government alter the project to make it socially acceptable it may no longer be commercially viable, which would remove two-thirds of funding from the table and no doubt increase costs because the Government do not have the skills or expertise to construct the road themselves. Does this mean we should let Transurban go ahead with the full project no matter the implications? No, certainly not. Below is my proposed alternative to a viaduct above Footscray Road whether or not it happens to be cost-effective. The diagram is not to scale, but I have removed four sets of traffic lights between Sims Street to the west and Appleton Dock Road to the east (off the diagram). I propose the Western Distributor should end just east of Sims Street with flyovers running into existing ground level lanes. Trucks which need to access Dock Link Road either to the north or south should loop under Footscray Road on the west or east using underpasses which already exist. Ending the new road here would prevent creating an undevelopable squalor, decrease construction costs and, hopefully, not present itself as the next best way to access the city by private transport. You may have noticed that I have represented the Western Distributer with only two lanes each way. While I expect the tunnels to be constructed with the capacity for three lanes each way, only providing two lanes, at least initially, would help prevent an unmanageable flow which would need to merge onto Footscray Road. Finally, while I provide reluctant support for the project as I have altered it, I would ultimately prefer taking port trucks off the road completely in the inner-west by moving freight, bound for the Westgate Freeway, by train to a new distribution centre near the proposed port at Bay West. The rail reserves already exist, they require far less manpower to operate and do not leave such a scar on our communities as are left by large, costly motorways.